We have an awesome cupcake store in our neighborhood and every now and then we take the kids by to enjoy a special treat. Without fail, their eyes are always drawn to the most colorful cupcakes in the display case. My kids may have no idea how a red velvet cupcake made with crimson food dye actually tastes, but put something like it in front of them and their immediate response is, “that one”. My take on these cupcakes have a rich flavor, and while they aren’t as artificially red as the red velvet cupcakes which use chemical food dyes (and of course chocolate which this one doesn't include), they (and their icing) get their bright, reddish-pink color from a surprising, delicious and 100% natural guest, roasted beets. Especially given the never-ending speculation about the connection between food dyes and hyperactivity in children, having smart alternatives for the artificially colored food that kids crave means I don't have to deprive my little ones. This doesn't mean we're not frequenting our local cupcake store any less often, but I always like reminding myself that whenever there's something out there I may not be thrilled about my kids eating, figuring out how to make a healthier version is not at all impossible. 2. Sift the first 4 ingredients into a bowl. 3. In a separate bowl, combine the rest of the ingredients. 4. Slowly add the dry ingredients into the wet and combine. 5. Pour about 1/3 cup into lined muffin tins and bake for 25 minutes or until a tooth pick comes out clean. 6. Cool completely before frosting. 1. Place all the ingredients in a mixer and beat on medium to high speed until fluffy. 2. Spread on cupcakes. My family has to try this!.. question, can I use whole wheat flour instead? If you use whole wheat flour they may be a bit dense. You could try white wheat flour! How can these be chocolatey if there's no cocoa or chocolate in them? They do sound good though; beets always add incredible moisture to cakes. Agreed with the comment above - it needs cocoa otherwise it is more like a carrot cake. Could you add a few tablespoons of unsweetened cocoa to the mixture? Red velvet cake is my favorite and I would love a dye free alternative! You could def. remove a few tbsp of flour and replace it with a few (about 3) tbsp of cocoa powder! I did this and it turned out amazing too. YUM! My kiddo loves the sweet beet cookies, so I can't wait to try this. Was wondering if you have a suggestion on how to roast the beets first? Do they taste like beets much? Beets are the one vegetable that I have never liked. I actually just made these. I have to admit that I am not a big fan of the flavor of beets, as well, although my kids love them. I think they taste to \"earthy\". Anyways, the Sweet Beet cookies were a hit in my house, but I wasn't too thrilled with them, cause they had a true beet flavor. These, surprisingly, did not, to me. The icing is a must as the actual cupcake is very bland, as is. The icing is a beautiful berry color when done, and has a great cream cheese flavor, rather than beet. I thought these were delicious and very pretty for a girl's birthday party. I could only get 12 cupcakes out of the batter, but thought that was fine as my cupcake pan only holds 12 or 6, so 14 would have been an odd number. Also, I had at least 6 cupcakes worth of icing left over, and I feel like I iced my 12 cupcakes quite liberally. I used the leftover icing to ice a batch of sweet beet cookies and then used the leftover to make my daughter some \"princess\" sandwiches when she got home from school, as a little snack. Wish it didn't have butter and sugar in it, but wasn't planning on letting it go to waste! My daughter is lactose intolerant, can I substitute the milk with a nondairy alternative. Any suggestions? You can always use whatever \"milk\" she drinks. My son has a milk protein allergy, so I just use his soy or almond milk in all my recipes that call for milk. These look beautiful, but I'm afraid to try them. How \"beety\" do they taste? I made a beautiful pan of beet brownies once and they were the only treat that ever molded in this house. Nobody ate them and I had to throw them out. I'm encouraged by the fact that they only contain 3/4 of a cup of beets. You've really captured all the esletniass in this subject area, haven't you? My husband hates beets but liked this when I made it as a cake with the regular cream cheese frosting (listed where I originally found this recipe) and topped with strawberries and blackberries. It was a big hit! I tried this a while ago for my son's 1st birthday. I think the dye works well in the frosting, but my cupcakes turned out dirt brown. Well, at least they *looked* healthy, like they were whole wheat or something. But they did turn out incredibly moist, and I wonder if the beet juice helped contribute to that. I'm also wondering how you roast a beet...cut up then bake under a high heat? Thx. I roast beets by simply sticking them in a pan in the oven at 375. Don't bother to cut them up or peel them or anything. Once they're done (poke with a fork to check, start checking after about 30 minutes), let them cool. Then the peel slips right off and you can use however you want. These are adorable! I'll definitely be making some for my daughter's third birthday next weekend! I love beets so i am excited to try these. We don't get fresh beets up here in the hinterland but i love canned beets (rinsed) so thanks for including the cup measurements. Thanks for the fun recipe! The color of the frosting is amazing! I love that you found a great sub for artificial food dyes. I will definitely have to try this! What can I substitute the oil with? I always substitute oil with applesauce when baking. Works great and healthy too! where did you get the sprinkles? Can you use canned beets instead of fresh? would steaming the beats instead of roasting affect the recipe any? We LOVE your sweet potato muffins and I steam the sweet potatoes instead of roasting as it is alot faster. Did you steam the beets? And did the cupcakes turn out okay? I failed at roasting my beets. Not sure how, but I did. If steaming worked, I think I'll try that, too! Just wondering what I could use instead of honey? I was wondering if you could use sugar instead of the honey. If so, how much? I was going to make these for my daughter's 1st birthday and am not ready to introduce her to honey. I tried them yesterday, they were very good. I just had a question, the batter stuck to the lining too much, is this normal/. I used A gave instead of honey, at the beginning I thought they were not sweet enough, however, they turned out just sweet enough with the frosting. Thans again for a nice recipe. i made these a few days ago and so far everybody adults n kids love them!! cant wait to make another batch! i also added 3tbl of cocoa powder my husband thought it was a chocolate cupcake! Catherine- I've been making your recipes as often as possible (and sharing them with friends) since my little one started eating solids (he's 2 1/2). These are delicious and so moist! However, they lost their color? Any tips on that? Made these yesterday and they turned out so yummy! I used buttermilk (well, 1 tbsp vinegar then filled up to 1 cup with milk)and 3 tbsp of cocoa. It's been awhile since I've had a real red velvet but this came out tastier and more moist than the last version I tried with no dye. I'd like to make this recipe into one ladybug cake instead of individual muffins. Do you have any suggestions for how I should tweak the ingredients or baking instructions so I'm still successful with a moist and yummy cake? Catherine, both of my 24 month-old toddlers (and I of course) thank you for giving us a delicious (and healthy) dessert for Valentine's Day. We substituted AP flour for WW Pastry and it still came out light and fluffy (you're recipes are amazing). We'll definitely be baking these again in the future- they WERE so yummy. Hi there, Would someone please be able to tell me if I can make a sheet cake using this recipe? I would be using an 18 x 12 sheet cake pan or a slightly smaller jelly roll pan. thank you! This recipe looks rlaely good, Cindy. Love a good banana cake!Wow, it's not even that hot here in sunny Florida. We're hovering in the low 90's in the Tampa Bay area. I can certainly identify with you about restless sleeping when it's so hot. Our A/C went out about a week ago and it was a full 24 hours before the repairman could get here to fix it. Ugh! With 4 ceiling fans running on high speed and a huge floor fan, it was still 90 degrees inside my house. It was so hot, sticky, and miserable that I only got a few hours of sleep. In addition, I was unbelieveably irritable and ended up with a splitting headache from enduring the unrelenting heat. And my poor dogs did nothing but pant for 24 hours! What in the world did we ever do before air conditioning? Catherine, these are PINKALICIOUS! My 2 1/2 year old toddlers loved them. Thank you so much. We substituted whole wheat pastry flour for the AP flour, and unsweetened applesauce for the oil. We also took your advice and swapped out 3 T of flour for cocoa powder. The result- light, fluffy and delicious red velvety cupcakes. Thank you again Catherine. Just made these for my daughters first birthday. They are a hit! I love that they are so low in sugar, and aren't super sweet. The color of the frosting is stunningly beautiful. This recipe definitely goes in the recipe box! Ugh! The cupcakes are good but the icing came out a little iffy. Way too beet-y!! What can I do to fix it? I tried adding more powdered sugar and that didn't help. Suggestions?! They are so stunningly beautiful, I'm dying to make them work! You could use a little less beet puree and keep the rest of the ingredients the same if you don't like the beet flavor! if I substitute the honey with coconut palm sugar will it mess up the texture? It will be a slightly different texture and taste, but I think it should be okay! I would use 3/4 cup sugar and add 1-2 tablespoons more of oil since you'll be losing some of the moisture that comes from the honey! It was so nice to see a familiar face in my new Parenting magazine. Congrats Catherine! I'm planning for my kiddos under sea birthday party at the very beginning of February. I'd love to use this frosting minus the beats. I plan to add a bit of juice from red cabbage which is supposed to make blue instead. Any idea if that would work? Do you need the beat puree for this recipe? I know you also have the butter cream frosting recipe, but I was hoping for a yummy lower sugar version like this one. Thanks for any tips you might have. You could leave out the beet puree! 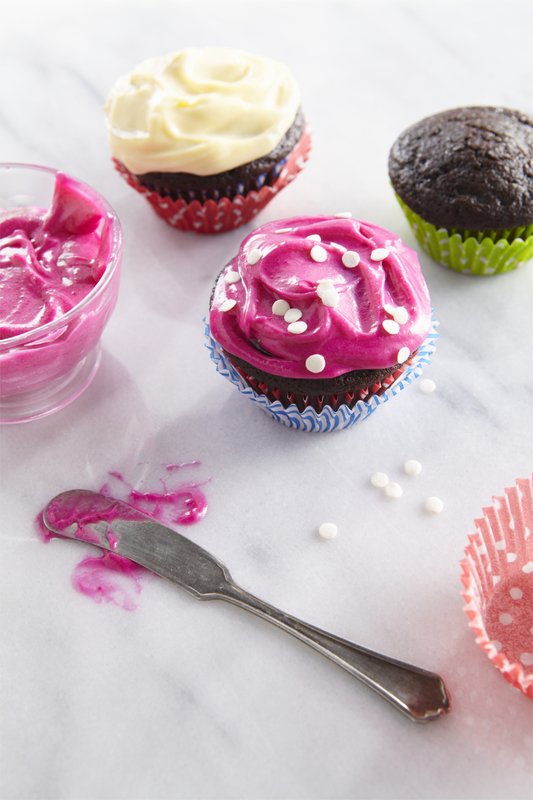 Blueberry juice will turn the frosting purple and raspberry juice will turn it red or pink! I made the frosting today and it's delish!!!! I have 2 questions. 1. 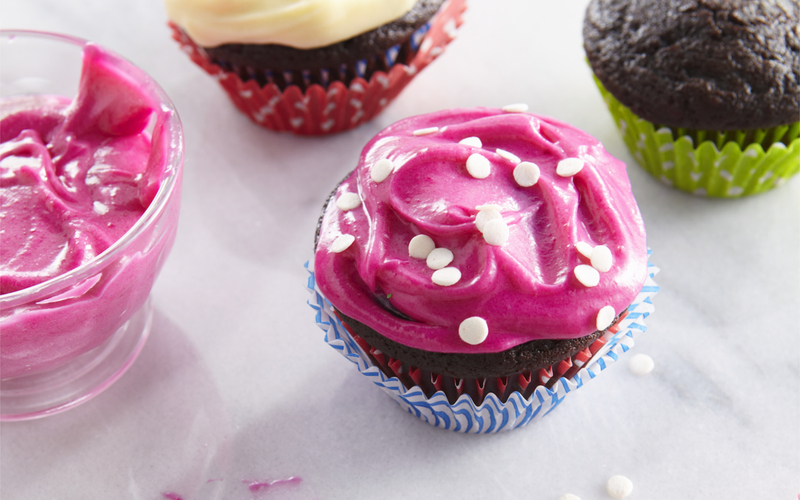 Can you freeze the frosting or will it mess up the texture during thawing? 2. Is anyone concerned about staining of clothes? I'd like to make these for Valentines Day for my daughter's preschool class. I'm a little worried that the kids may get messy and stain their clothes! Any thoughts on this? In case anyone is wondering, I did make these with canned beets and the cocoa and they are fantastic. I made a frosting of some butter, cream cheese, vanilla, powdered sugar, and beet juice. Well, these sure sound healthy! I had some roasted beets that no one in my family, except for me, would eat by themselves. So .... I needed to bake something. These cupcakes need some sugar I think, but then again, I am not planning on putting icing on them. They taste more like healthy muffins than cupcakes. But still good. We will se what my three- year- old will say. Is there any alternative sweetener I could use in the frosting? Like brown rice syrup or malt barley syrup? And would I have to add any dry item to make up for the moisture addition? I just made these today. I used whole wheat flour, subbed brown rice syrup for the honey and added the cocoa powder because I wanted them to be more muffin like than cupcakes. I made them as mini muffins and my three year old kept stealing them off the cooling rack as quick as I could put them on, he ended up eating 12 just for lunch :P.
I made a devil's food cake instead of this recipe and added pureed beets to the batter before baking. Then strained leftover beet puree and used the juice in the cream cheese icing. They were so delicious No one ever thought there were beets in them. I just made this cupcake, color was vibrant until it was baked. The cupcakes didn't have the red coloring to it anymore, it was dulled. All in all, the cupcakes did tastes good. Could I make this into a cake? Which size pan to use and at what temperature and how long in the oven? I am all out of AP flour, could I sub all with whole wheat flour? And could I sub the honey with maple syrup? I am also out of honey. I am looking forward to making this on Saturday for my daughter's 3rd birthday. We made your green spinach mini muffins for a daycare potluck party and all love it!